A lot of people have asked me about this in terms of the best way to set up their kids on iTunes. To me there are a lot of different variables to consider, but here is how I set up my family in case it works for your situation as well. 1. I set up a “kids” iTunes user ID that all my kids share. This is the ID that you actually link to the iTunes store for purchase. The reason they share this ID is that all purchases (apps, music, movies, books, etc.) are tied to the ID. What I did NOT want was one daughter buying an app, then later another daughter buying the same app and now we have paid twice. So the deal with the kids is that what one buys they all get. Plain and simple. I know down the road they will probably get a “big kid” account, but then they won’t want all their kids apps and songs anyway so I think I’ll be ok.
One other major advantage now that Apple allows to automatically download new purchases, the kids devices are all up to date without a lot of work and they all immediately get the value of the purchase. Pretty cool. If you open iTunes, under Store you can see what account is currently linked. One side note on this, you can only have 5 devices sharing the same account. So depending on the number of kids/devices in your family this may or may not work for you. I have actually seen other families do a Young Kids account and a Big Kids account for that very reason. 2. I set up each kid with their own iCloud account, however. 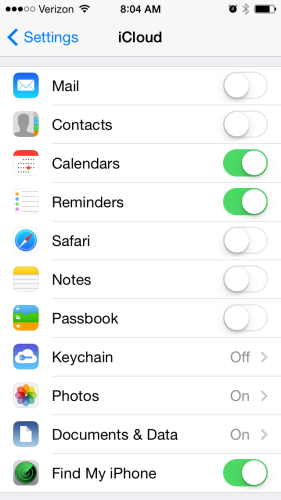 The reason for this is that they can then have their own info (contacts, calendar, settings, etc.) but mainly because it makes the “Find My iPhone” app a little easier to manage. And they lose their devices all the time. This little trick has saved much pain for us. If you navigate on the iPhone/iPod/iPad to Settings > iCloud you can see what account is currently linked. 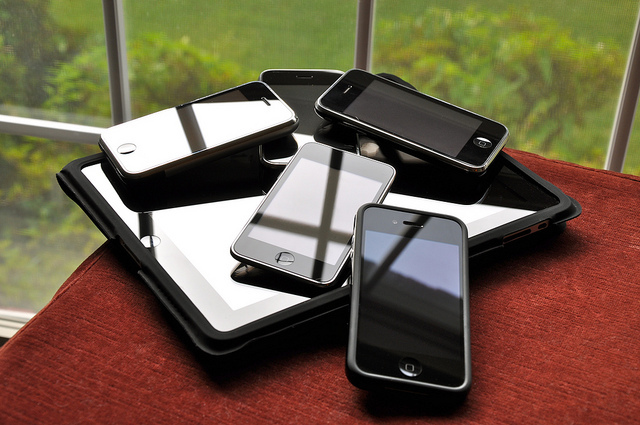 NOTE: make sure to turn ON “Find My iPhone” for all your devices. Even if they are just connected via wi-fi like my daughters iPods, it’s a great tool for keeping track of misplaced devices. I also turn off the storage of photos into their iCloud account. My kids take way too many ridiculous pictures and videos. They can sync with the main computer whenever they want to store them, I don’t want to pay for iCloud storage for all that. Just my take. 3. 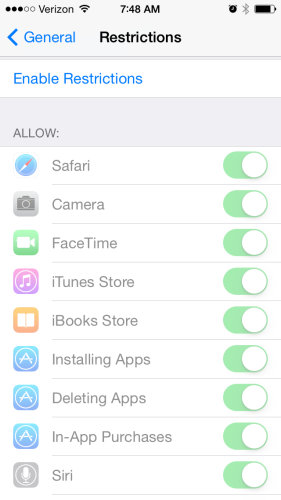 Lastly, under each device I navigate to Settings > General > Restrictions and click to “Enable Restrictions”. Here is where you can throttle to whatever level of protection you like. You can allow/disallow certain apps, set age limits for content (though know that is only true if they are accessing that content through the Apple store – if they are watching it through Netflix those settings are controlled via Netflix). Anyone else have any tips for how they set up their family device life?